A little perspective goes a long way especially when it comes to real estate market concerns. I’m hearing a lot of people talking about how the real estate market in Charlotte is slowing down. There is some truth to that statement because demand is slightly lower than it was this time last year. But lets take a closer look because there is certainly no cause for concern. 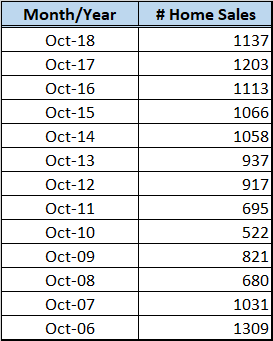 Consider the chart below which shows the number of home sales in the month of October for each of the last twelve years. There were 1137 single family home sales in Mecklenburg County in October of this year. This number is down 5% from the same month last year. However, we had the second greatest number of sales in that month than any other October in the past ten years. 2017 had the only October with more sales in the past ten years. Needless to say, the real estate market is still alive and well and prices continue to climb. This October saw an increase in average sales price of 9% over last year. With that kind of price growth, its not a bad thing to see home sales begin to cool off a bit. Home sales are down 3% from last month and 5% from last year. Average sales price is down 3% from last month, but up 9% from last year. Median sales price is down 3% from last month, but up 7% from last year. Average price per square foot is down 2% from last month, but up 8% from last year. Average time on market is up 2% from last month and 8% from last year. Pending sales are down 1% from last month and 11% from last year. Supply is down 2% from last month, but up 7% from last year. Mortgage rates are up to 4.83% from 4.63% last month and 3.90% last year. Average house payment is flat from last month, but up 22% from last year. Lots to be thankful for in 2018. Happy Thanksgiving!